← You Best Believe Today is Jungle Book Day! Anybody else doing everything they can to avoid reading too many reviews for Captain America: Civil War? I can’t believe they’re out so early! They’re all so good that I just want to absorb as much as I can! But at the same time, I don’t want to spoil anything in the movie. It’s bad enough I’ve watched a few of the clips. Aargh! Why isn’t it May yet? Until then, why not enough some comics? New issues of Amazing Spider-Man and Starfire grace our presence this week, as well as the launch of the Harley Quinn spin-off staring her Gang A’Harleys! 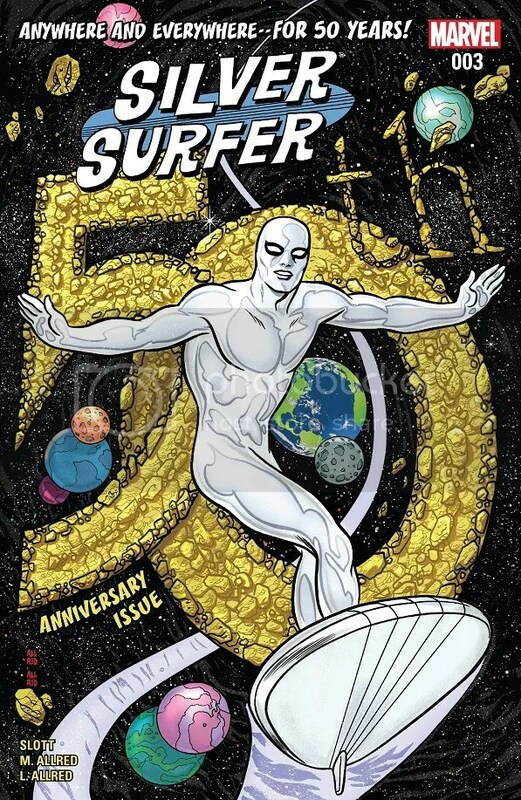 Comic Book of the Week goes to Silver Surfer #3. It’s been awhile since we saw an issue of this amazing series, but the wait was worth it! 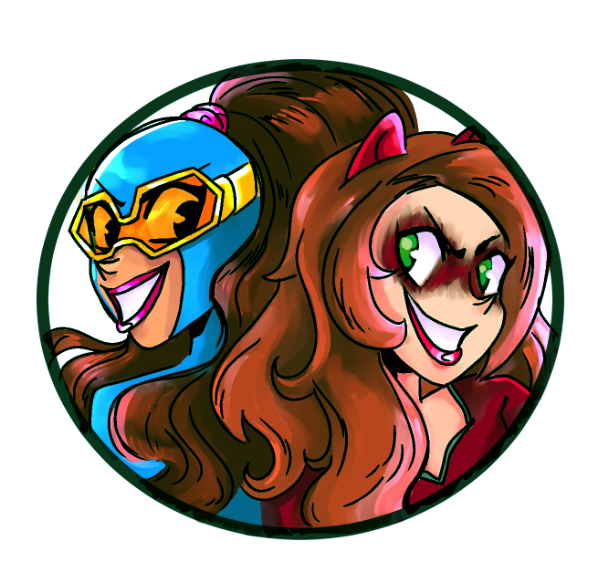 And as always, don’t forget to check out my Kickstarter for the full Gamer Girl & Vixen graphic novel! We’re at the halfway point this weekend, so now’s the time to really gear up and hit the goal by the end! Comic Reviews: Amazing Spider-Man #10, Harley Quinn and Her Gang of Harleys #1, Silver Surfer #3 and Starfire #11. This Spider-Man story hasn’t been the best, but I’m still enjoying Slott’s overall work. 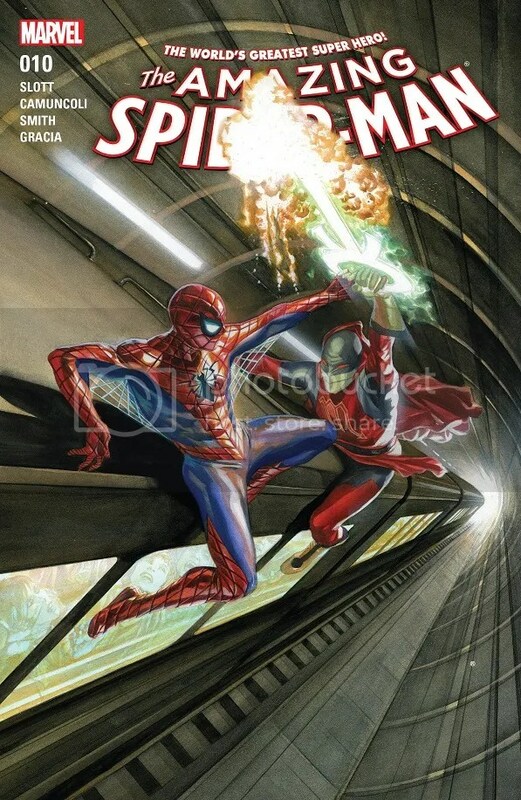 I really want to see him push this Parker Industries storyline as far as he can. Spider-Man is battling Scorpio and the Zodiac to stop them from taking over the world. He very nearly gets killed by Scorpio in a battle in France, but the villainous leader is called away by the Gemini twins, who can see the future and need him to leave. Spidey tries to catch up to them, but is defeated on top of a speeding train. So in an effort to track Scorpio and Zodiac, Spidey calls on his team of super smart scientist employees, and they track Scorpio to the home of Mr. Jacobs, the #1 investor and stockholder in Park Industries. Spidey is aghast at the reveal, and Scorpio threatens that he could tear Parker Industries down from the inside if he so chose, and that he has come this far thanks to the company’s resources. Spider-Man declares that he would tear it down himself if it meant stopping Scorpio’s sinister schemes. Honestly, I don’t find Scorpio or the Zodiac to be very compelling villains. I never have and I probably never will. Why Slott chose them as the lead villains of his Parker Industries-era Spider-Man is anyone’s guess. I’m all for cracking open the big encyclopedia of Marvel characters and picking a cool, random villain, but I just don’t think Slott has made them very interesting yet. Scorpio is kind of just a generic evil dude with plans to take over the world. Sounds familiar. So the real pleasure of this comic is in seeing Peter Parker/Spider-Man struggle against the odds, and that’s still fun. And Camuncoli’s art remains top notch. This is a great creative team telling a pretty fun story. I just wish the antagonists were a little more interesting. 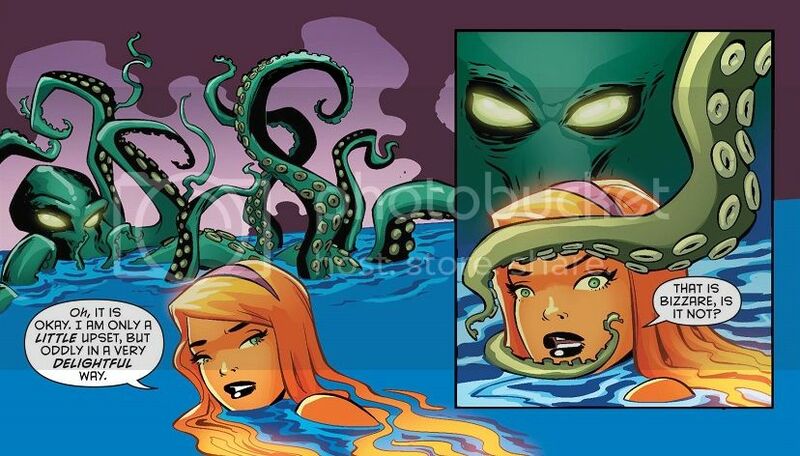 Fortunately, Slott seems to be building to something with Rhino, Lizard and some of Spidey’s classics. And a returned Doc Ock is still waiting in the wings. Not that the only villains who work are Spidey’s classic villains, but the Zodiac have always be hum drum. I’m digging Palmiotti’s regular Harley Quinn series, so of course I’ll check out this new spin-off. The Gang of Harleys has been a fun idea, but they haven’t really had time to shine when Harley herself has so much to do. A mini-series on the side sounds like a plan. After leading her team in beating up the Hipster Mafia in Brooklyn, Harley Quinn is kidnapped by mysterious forces! It’s up to the Gang of Harleys to scour New York City for their boss — though they mostly spend the time hitting up nightclubs and visiting the zoo. Eventually, Coach figures out that Harley kidnapped herself with help from Big Tony and her housemates, as a test for the Gang. But when the ruse is uncovered, everyone finds out that Harley really has been attacked by a new, grotesque villain: Harley Sinn! This was a fine comic. I’m a big fan of both Palmiotti and Tieri, and Mauricet’s art is pretty fantastic. But this comic seems more ‘for fun’ than anything more meaningful. Which is totally fine. It’s a fun little jaunt, though I think the time for hipster jokes has passed. Those fell a little flat. The Gang itself is very entertaining, and I hope the writers develop them more as individuals. The plot is pretty good. I didn’t realize that Harley had kidnapped herself until the actual reveal arrived. All in all, this was a pretty good start to this little mini-series. 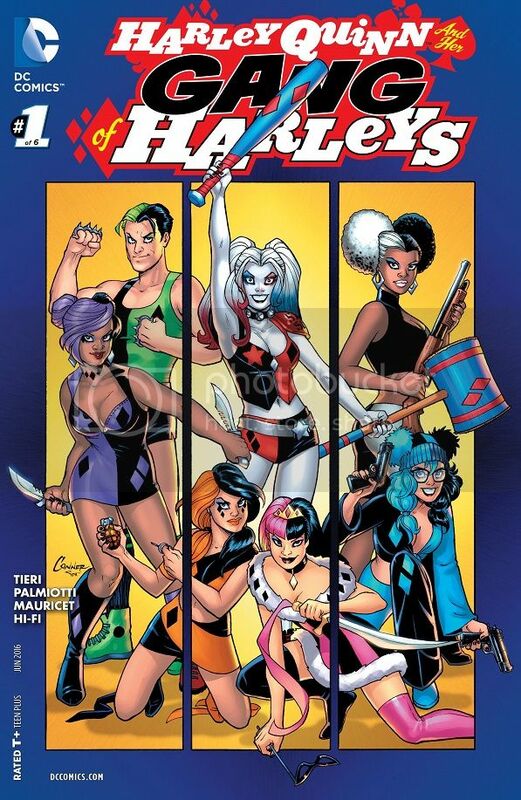 If you’re a big fan of Harley, especially her solo comic, this could be a fun side project to read if you want even more Harley Quinn. It seems like forever since the last issue of Silver Surfer, but I’m glad we’re back! This series is still so much fun and adorable. And this issue gives us plenty of action! Shalla Bal and her minions have used the power of Zenn-La to transform countless planets across the solar system into Zenn-La duplicates, under the premise of bringing Zenn-La perfection to backwater worlds. When the Avengers show up to aid the Silver Surfer, they too are transformed into Zenn-La versions to attack him. Fortunately, the arrival of Dawn Greenwood and Alicia Masters is able to snap Benn Grimm out of mind control, and he and the Surfer team up to hold back the Avengers and try to stop Shalla Bal. In the end, the Silver Surfer sacrifices the Power Cosmic and possibly his life to destroy Shalla Bal’s great machine, reversing all of the terraforming she’s done across the galaxy. Once again, the best part of this comic is Dawn Greenwood and her relationship with the Silver Surfer. The rest of the stuff is pretty crazy, from the idea that Shalla Bal could Zenn-La-form so many plants, to the current Avengers roster cameo, and all of it is a ton of fun. But it’s in seeing Dawn and the Surfer interact, even in the midst of battle, that’s so great. And now they’ve got Alicia Masters in the middle, providing a great new wrinkle in the whole thing. I love this comic book relationship. Slott and the Allreds nail it every time, with new great scenes between them each issue. 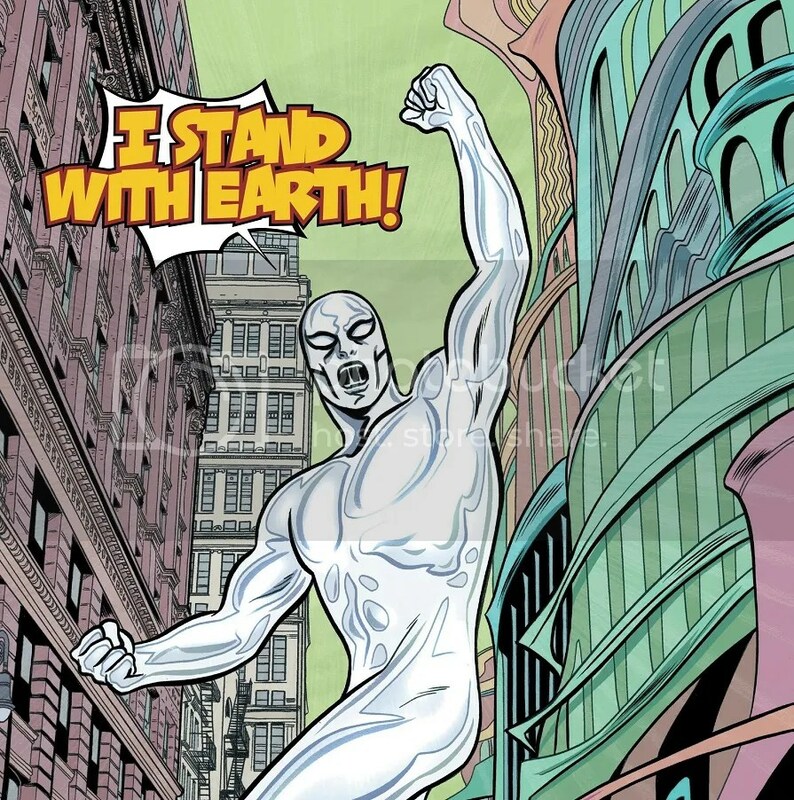 It’s probably safe to assume that the Silver Surfer is not dead. It’s only issue #3. So I’m looking forward to future issues of Dawn juggling the superheroes of New York while the Surfer recuperates. Keep the two of them together and you’re going to get a great comic. Loving everything Slott and the Allreds are doing with this book. Interestingly enough, Starfire is going to end up in a new version of the Teen Titans in Rebirth. We’ll see how that goes. But it looks like that means Conner and Palmiotti have to clean house with their little comic before we get there. Kori, Stella and Atlee enjoy a nice, relaxing vacation down in Atlee’s home kingdom. It’s soothing, it’s peaceful, there’s lots of partying and bonding. It’s a good time. But when they take a dip in some magical pools, Stella opens up a bit too much and tells Kori that she doesn’t want the alien dating her brother, because it could put him in danger. That kind of sours the whole rest of the trip, even though Stella apologizes profusely. The girls eventually return to the surface, with Kori planning to move out. But when they arrive right in the middle of Key West’s big summer party, she decides to stay a big longer. No less than Jimmy Palmiotti himself as corrected me when I’ve made wrong assumptions about Starfire, so I’m not sure what to say about this issue. On the one hand, having Stella suddenly tell Kori not to date her brother Sol feels like a total reversal of everything the writers seemed to be building towards, possibly a slate clearing with Rebirth right around the corner. But on the other hand, Palmiotti has said in the past that these 12 issues were exactly what he and his wife planned. So what do I know? I do know that Stella’s comments really did kind of sour the rest of the issue, probably on purpose. I enjoyed the scenes of the girls bonding, and definitely liked the big, fun atmosphere of the whole thing. But Stella totally killed the mood by preemptively breaking up Kori and Sol. 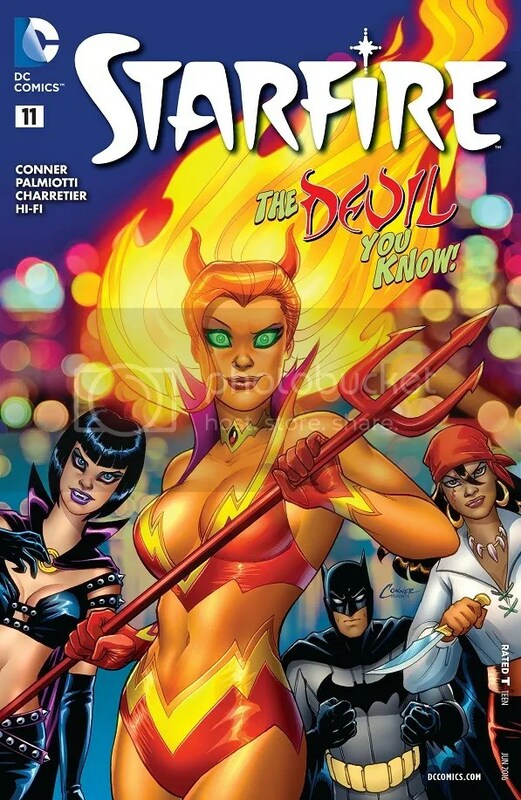 Posted on April 16, 2016, in Comics, DC, Marvel, Reviews, Spider-Man and tagged Amazing Spider-Man, Harley Quinn, Harley Quinn and her Gang of Harleys, Silver Surfer, Starfire. Bookmark the permalink. 2 Comments. Spider-Man was . . . OK? I guess? But can Slott just not write Spider-Man any more? Because it really hasn’t been particularly enthralling since Superior ended. It’s just been bland. It’s time he moved on and let someone else have a chance at the title. Silver Surfer is fantastic. It is such a wonderful series. This issue did more to sell me on Alicia than any Fantastic Four comic ever did. There’s so much whimsy and wonder and pathos to the issue, and it’s so good. It is such an amazing series. You make a good point about Slott. Superior was, by far, the high point of his time on Spider-Man. The rest has been kind of bland. Anna Marie is shuffled off to the side. No new, compelling love interests for Peter. Nothing really compelling for Peter at all. He just is Spider-Man against whatever random villain comes next. At least Slott is killing it on Silver Surfer. Very good point on Alicia Masters! She was exciting in this issue.